I have been loving the music of Shirley Horn for several years now. It began when a friend recommended the “Glengarry Glen Ross” movie soundtrack to me. Shirley sang “You’d Better Go Now” and I played it over and over again. Soon after, I heard “Here’s to Life” one evening on Ramsey Lewis’ syndicated radio show. I got her album and played it in heavy rotation. I was totally smitten. On June 15, 1993, 11 days before my 30th birthday, I saw her for my first time in concert at Murray Theatre @ Ravinia Park in Highland Park, Illinois. Ramsey Lewis escorted her onstage. I was seated on the left side of the theatre so I was able to see her hands on the keys as she played and sang that evening. I was mesmerized. There were three trademarks of a Shirley Horn concert that I learned that evening. She plays in gloves until she’s comfortable enough to take them off, she does not interact much with the audience during her concerts, and she does not normally do encores. You understood that her focus was the music and she put every ounce of her heart into it. Her use of space and silence were breaktaking. Her interpretation of a lyric and phrasing were unmatched and she played piano like there were two people playing at once. She serenaded us for over two hours that evening and received a standing ovation at the end of the concert. Is that Shirley Horn playing? After seeing her in concert for the first time, I spent the next few years looking for every Shirley Horn album that I could find. It was in the spring of 1994 and I was in a favorite used record store in a Chicago suburb browsing through titles and heard some music that I just had to have. They were playing a reissue of her Travelin’ Light album, which was originally released in 1965. I begged the store employee to sell me the album and I was really glad he did. Of course now I have over 20 of her albums. Tickets for Shirley Horn are now on sale? It was March 1, 1997 and I was enjoying Dianne Reeves in concert at the DuSable Museum in Chicago. At intermission, they announced “tickets for the April 26 Shirley Horn concert are now on sale.” I think all the blood rushed out of my head and I was about to faint at that very moment. They also mentioned there would be a reception with her before the concert. I went to the box office to buy the $75 ticket so I could attend the reception and concert. The woman at box office argued with me because I only wanted to buy one ticket. In the end, only one ticket was purchased. 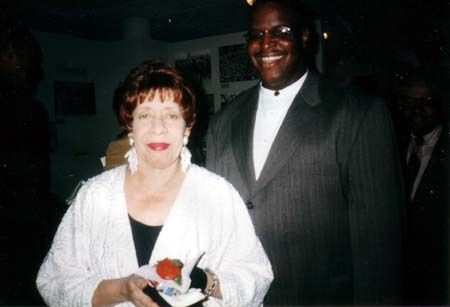 A Shirley Horn concert was not something you could share with everyone and if I had taken someone that could not appreciate the magic of her music, I would have never forgiven myself or them. The photo above was taken at the reception before the concert. When I met her, I was like a little kid just rambling on to Shirley about how I was her biggest fan and that I had a lot of her music. Even though she was fixing her plate at the time, she was very gracious and kind. It was a wonderful concert and a great evening. There have been many great moments with Shirley that I will always treasure. Her music and her spirit will always be with me. In recent years, she faced many life challenges but the music was still the center of her life. I saw her a total of nine times in concert. I considered every time that I got to see her a musical blessing. I remember during her season opening concert at the 1999 San Francisco Jazz Festival, she wowed me with a rendition of “Ten Cents A Dance” which I had only heard on one of her early albums. She shared the bill that evening with bassist Charlie Haden so she came back out during his set and sang a couple of the songs which she done on his album, The Art of Song. She seemed a little uncomfortable initially because she was not at the piano. She quipped, “I am not used to this” but she did a fine job. In later years, she was unable to play piano for herself but she still gave a great show but I could not help but wishing she would be able to play one or two songs. She performed at Yoshi’s in June 2003 and I saw her twice during the run. Without being at the piano, you got to experience a little more of her sense of humor which, being the consumant performer, you did not normally get to see. She totally broke character when during a verse of “I Got Lost In His Arms”, she said “child, please” and moved right on with the song. I think it was one of the few times I actually laughed during one of her concerts. After the concert, I got to go backstage and meet her once again. I did not ramble as much this time yet I was awestruck. She said, “Hi, I’m Shirley” and I kissed her on the cheek and thanked her for her wonderful concert and music. She was the essence of cool. She had a brandy snifter and her Pall Malls cigarettes at her side. We chatted a few minutes and she signed my promo copy of her upcoming album May The Music Never End. She asked me how did I get a copy of the album when she had not even seen it yet. Her manager mentioned that I was a music reviewer. I floated on a cloud all the way home. I saw her for the last time in concert on April 30, 2005, just two days before her 71st birthday. There was such anticipation in the air for me because I knew that Shirley would be back at the helm of her Steinway. They wheeled her out to the piano and her magic began. I will go into more detail of the concert in a separate review very soon but I will say that she treated us to a show that I will never forget. She played and sang superbly. You heard her opening notes of “Fever” and you knew you would be in for a treat. “Here’s to Life” was even more special when she sang “may all your storms be weathered and all thats good get better.” She also paid tribute to Ray Charles with a spirited version of “In The Dark.” She totally surprised the audience when she came back out and sang an encore of “Confession” accompanying herself on solo piano. I smiled when she sang the playful lyrics, “I always go to bed at ten, oh isn’t that a bore. I always got to bed at ten and I go home at four.” I will always remember that moment. My heart goes out to the Horn and Deering families and her manager, Sheila Mathis. May the music truly never end. This entry was posted on Sunday, October 23rd, 2005 at 11:27 pm. It is filed under Shirley Horn, Special Feature and tagged with Remembering Shirley Horn, Shirley Horn. You can follow any responses to this entry through the RSS 2.0 feed. Thanks for sharing those great memories. We’ve lost a legend. She was a real jazz diva, a real artist, not trying to buy the audience, pure truth in each sung word and played chord. I won’t forget her. She was supposed to play in Poland but didn’t make it. I dreamed to hear her live. I’ve learned that before her death internet contained not much info on her and only now there is something. There is a good source of information, a free encyclopedia everyone can edit – wikipedia.org. For the moment it only contains a stub about Shirley. I’m not a person who knows a lot on Shirley’s life but now I can see that there are people who do. If you think it would be fair if Shirley has a good page there can you please update it? I think she surely deserves a good one there..